My password doesn’t work, what should I do? What if the library doesn’t have what I need? I can’t access a library resource, what should I do? Use this bookmarklet when you find an article through an outside search like Google Scholar. If we subscribe to the content, you'll be immediately redirected to our login page for access. Frederick L. Ehrman was Chairman of the Board of Trustees of NYU Langone Health and a Trustee of New York University. Both he and his wife were major contributors to the Medical Library, named the Frederick L. Ehrman Library, and to an endowed professorship in Cell Biology. Ehrman was a director of Radio-Keith-Orpheum Corporation since at least 1939. (Reorganized R.K.O. Lists New Officers. New York Times, Feb. 25, 1939.) In 1959, he was part of a group of insurgent stockholders which failed to gain control of Bayuk Cigars. The group included Howard Mack, Harry P. Wurman, Edgar M. Cullman, Richard C. Ernst, Armand G. Erpf, Judd L. Pollock, Simon H. Rifkind and Robert E. Simon Jr. (Insurgents Defeated in Contest For the Control of Bayuk Cigars. New York Times, May 7, 1959.) 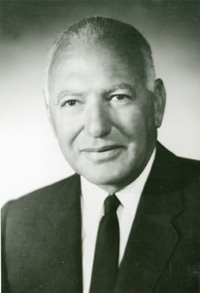 He was elected to the board of Bellevue Hospital in 1959, and became chairman in 1969. (Ehrman Elected Chairman of N.Y.U. 's Medical Center. New York Times, Apr. 2, 1969.) In 1973, Peter G. Peterson became the new chairman and chief executive of Lehman Brothers. Ehrman's nephew, F. Warren Hellman, remained as president of the investment banking house. (Peterson Named Chief Executive of Lehman Brothers. New York Times, Jul. 27, 1973.) David D. Sabatini, a member of the 1996 Scientific Advisory Board of the Council for Tobacco Research, was the Frederick L. Ehrman Professor of Cell Biology and Chairman of the Department of Cell Biology at New York University.